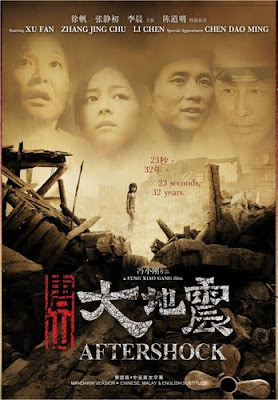 The city of Tangshan in China suffered a devastating earthquake in 1976 that left 240,000 dead. But Aftershock doesn't exploit the extent of the devastation, but homes in on the lasting effects of the disaster on one family. 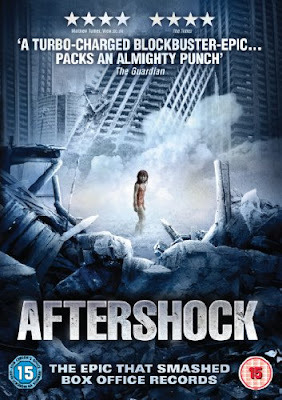 Early in the story, the quake is shown from the perspective of a few people in one neighbourhood (rather than an overview of the city), as a mother and father race to protect their children. The amazing scene is a seamless mix of CGI and large-scale sets. But unlike the disaster movies that I'm used to, the accent wasn't on spectacular destruction. The deaths had more emotional impact, helped by the random victims being played by actors rather than 'digital stuntmen'. The story really begins when the dust settles and it emerges who survived. 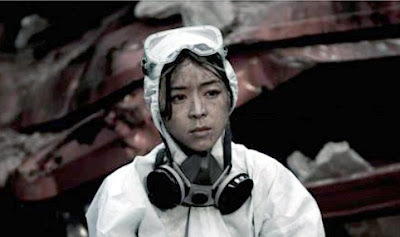 As rescuers dig through the rubble, the mother is forced to decide between the lives of her son and her daughter. A natural disaster has forced her to make the most difficult decision of her life, and could ruin the rest of it. She reluctantly chooses to save her son. Without her knowing, her daughter has miraculously survived, but heard her mother decide against saving her. Also completely traumatised, she walks away from the city to a new life. The story then repeatedly leaps forward to see how these survivors lead their lives, still haunted by the day of the quake, right up to the present day, 32 years later. Some of these 'fast-forward' fades-to-black avoid many events that are ripe for melodrama. The director avoids many of the cliches, often leaving the viewer to deduce some of the major changes in the characters' lives. In the background, there's a summary of the last thirty years of life in China. It's interesting to see the similarities and differences between western life and communist society. I've read that this film didn't get an Oscar nomination because it didn't appeal enough to an international audience, but it's far from inaccessible. There are very few important references to historic events or unfamiliar places. There also seemed to be a conscious decision to appeal internationally. 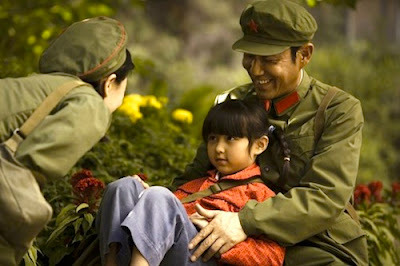 An orphan being fostered by both parents in Red Army uniform looked like it was aimed at non-Chinese viewers, trying to counter decades of negative depiction of communism. The opening shot had me a little worried, a swooping helicopter shot of Tangshan, filled with unconvincing CGI dragonflies, (an illustration of the kinds of natural warnings China had before the quake). Understandably, there were also CGI establishing shots of Tangshan as it was before the quake. But soon the film settled down as a very high-quality production, with the exception of one non-Chinese actor who spoiled a later scene. Xiaogang Feng, director of Assembly (2007) and The Banquet (2006) assembled a fantastic cast who convey some truly heart-rending scenes. Though apart from the quake itself, the many intimate dramatic scenes were hardly an obvious choice for an IMAX presentation, as it was in China. With so many regular natural disasters around the world, and so many people affected, it's hard to let yourself be affected by each new catastrophe. Hollywood disaster movies also maintain this distance, rarely depicting death tolls, permanent injuries and lasting emotional effects. For a disaster movie, this unleashed a huge emotional impact on me, emphasising the personal tragedies that last for decades after the funerals are over. I watched a DVD from Hong Kong, released by Media Star, with good subtitles and widescreen anamorphic aspect. The extras were deleted scenes, cast interviews and a trailer, but these had no English subtitles. The USA has yet to release this, but there was a limited run in the UK and there's now a DVD, with cover art misleadingly showing skyscrapers in the background (above) - compare it to the Chinese DVD art (at top). An extensive, spoilery review on Asia Pacific Arts. This actually got a US release back in October... it was 20 theaters across the US(in cities that have large Asian populations). I know here in New York they did zero advertising and other than the fact it was reviewed in Time Out New York I wouldn't have known it. I know one person who saw it in a theater, and that was because the film suddenly appeared in the local theater. This was one of the best films from last year. I've been going on about it since I saw it. I'm glad someone else has noticed it. Thank you, I'll correct the article. I couldn't find a DVD release - perhaps they changed the name as well? I really wish this hadn't slipped under my radar. This won't be anywhere near as good on a small screen. I saw a Hong Kong DVD as well. I know it's just come out on DVD in Europe, but I don't think it has a US release coming any time soon. I blame that on China Lion who released it in the US but isn't getting word out. They Have a remake of What WOmen Want currently in Theaters- but if Subway CInema News hadn't posted on it I never would have known. 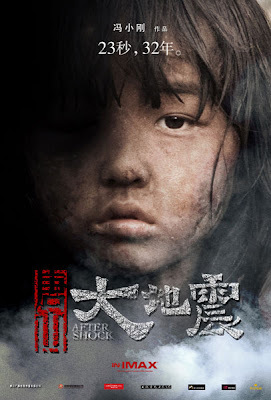 as for Japanflix'ssaying it won't be as good on the small screen, after the first half hour the spectacle is over so any power it has is in the characters and as I think you can atest thats enough to kick you to the curb even on a small screen.